A glove (Middle English from Old English glof) is a garment covering the whole hand. Gloves have separate sheaths or openings for each finger and the thumb; if there is an opening but no covering sheath for each finger they are called "fingerless gloves". Fingerless gloves with one large opening rather than individual openings for each finger are sometimes called gauntlets. Gloves which cover the entire hand or fist but do not have separate finger openings or sheaths are called mittens. Mittens are warmer than gloves made of the same material because fingers maintain their warmth better when they are in contact with each other. Reduced surface area reduces heat loss. A hybrid of glove and mitten also exists, which contains open-ended sheaths for the four fingers (as in a fingerless glove, but not the thumb) and also an additional compartment encapsulating the four fingers as a mitten would. This compartment can be lifted off the fingers and folded back to allow the individual fingers ease of movement and access while the hand remains covered. The usual design is for the mitten cavity to be stitched onto the back of the fingerless glove only, allowing it to be flipped over (normally held back by Velcro or a button) to transform the garment from a mitten to a glove. These hybrids are called convertible mittens or glittens, a combination of "glove" and "mittens". Gloves protect and comfort hands against cold or heat, damage by friction, abrasion or chemicals, and disease; or in turn to provide a guard for what a bare hand should not touch. Latex, nitrile rubber or vinyl disposable gloves are often worn by health care professionals as hygiene and contamination protection measures. Police officers often wear them to work in crime scenes to prevent destroying evidence in the scene. Many criminals wear gloves to avoid leaving fingerprints, . However, the gloves themselves can leave prints that are just as unique as human fingerprints. After collecting glove prints, law enforcement can then match them to gloves that they have collected as evidence. In many jurisdictions the act of wearing gloves itself while committing a crime can be prosecuted as an inchoate offense. Having a definite quality management system, we are actively committed towards offering Face Mask. 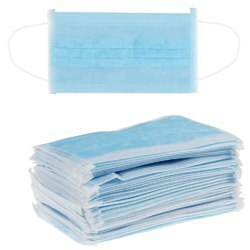 This face mask is made from very soft material which allows air flow in such a manner that the user does not feel suffocation. Available in universal standard size, this mark is widely worn in medical surgeries and laboratory examinations. Moreover, our complete line of masks includes ear loop & lace type. Owing to perfection and quality oriented approach, we have carved niche in the industry by offering Plastic Wares and Thermometers. Offered product is manufactured as per industry standard by our workforce at our manufacturing unit using finest material & leading techniques. The given product is accessible on numerous specifications in promised time-frame as per the customer's demand. This product is checked on various parameters so as to deliver a flawless range. Our best in quality Melting Point Instruments are exclusively designed to determine the melting points of solids or boiling point of liquids with complete accuracy. For heating the bath, this instrument is provided along with a silicon oil bath. In order to maintain a uniform temperature, a magnetic stirrers are also provided with this instrument. This instrument is incorporated with a microprocessor based circuitry and keys for setting the desired program for heating the bath.